Brenton Grove’s Dunlop Super2 Series car will adopt a retro inspired look for next month’s Sandown Raceway event (September 14-16). Round 5 of the Super2 Series supports the Virgin Australia Supercars Championship Sandown 500, which since 2016, has been celebrated as ‘Retro Round’ as the paddock pays tribute to the sport’s rich history. Each year, Supercars teams go all-out, supporting the ‘Retro Round’ initiative through one-off historic and throwback car liveries as well as retro team outfits. 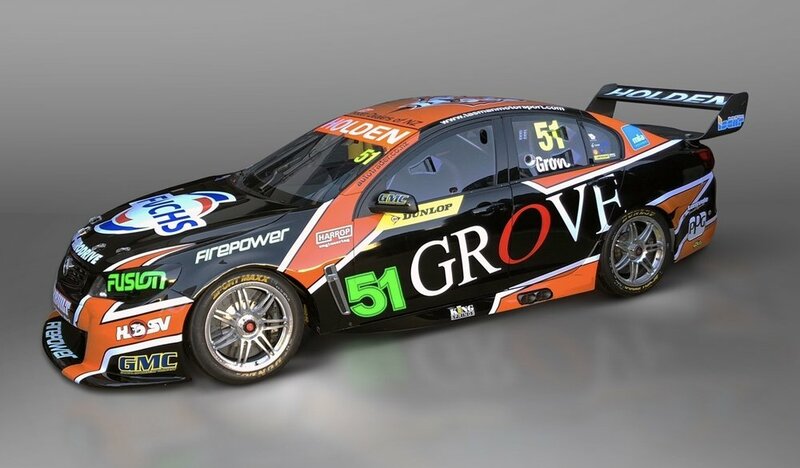 Grove Racing will also join in the fun for 2018, with the team celebrating its motorsport roots on the canvass of Brenton Grove’s Holden VF Commodore. Grove will be one of the first Super2 teams to specially adopt the concept for the round. The ‘retro’ livery is an identical copy of that which was run by V8 Supercars team Tasman Motorsport in the 2007 Oran Park Raceway V8 Supercars event, acknowledging the Grove Group’s introduction into the motorsport landscape. That weekend, the two Grove backed VE Commodores were steered by the late, great Jason Richards and fellow Kiwi team-mate, Greg Murphy. At the beginning of 2018, Grove Racing added a Super2 campaign alongside its burgeoning Porsche program, fielding young gun Brenton Grove in an ex-Triple Eight Racing Commodore. The 21-year old says the concept is one that has been a while in the making. “When we first started talking about retro round, we didn’t quite know what to do,” explained Grove. “It was actually Richo [Steve Richards] who suggested we do this car, since it was Grove’s first foray into motorsport and also Supercars. “It’s pretty amazing how things have gone full circle, from me always supporting Murph to him now commentating on my race. Sandown marks both the home event for the team and for Brenton, who is looking forward to getting back to a familiar track after a tough initiation into the highly competitive series. “Sandown is the first real track I have been to before,” he added. Track action is set to kick off with a pair of practice sessions for the Super2 Series on Friday at Sandown ahead of two 22-lap races. The event takes place from September 14-16. The Grove-backed Tasman Motorsport cars at the 2007 Oran Park V8 Supercars event.